‘From the Mediterranean shores of Tel Aviv, Israel’s fraught geopolitical position is almost non-existent. Tourists and locals alike sip Goldstar, Israel’s ubiquitous dark lager, as the waves roll in and out. Children laugh and splash in the water. A group of teens play volleyball as the sun sets. Tel Aviv is the Israeli state’s poster child, projecting an image of a country that is modern, open, welcoming and, of course, democratic. But it is only an image, a mirage, a shimmering falsehood that does not in fact exist – certainly not if you’re a Palestinian. What actually exists is an Apartheid state that has enshrined in law – the Nationality Law – Jewish supremacy. And lest there be room for doubt about the law’s intent, Knesset (Israel’s Parliament) Member Avi Dichter, a sponsor of the Nationality Law, provided confirmatory commentry: ‘We [Israel] are enshrining this important bill into a law today to prevent even the slightest thought, let alone attempt, to transform Israel to a country of all its citizen (sic).’ It is this state that is to host, in May 2019, the Eurovision Song Contest. Israel’s use of military force against Palestinian civilians is a prominent feature of its occupation regime. This militarised repression of the Palestinian people extends beyond the scenes of checkpoints and bombings we have unfortunately become accustomed to; Israel’s military and security services maintain an intense regime of surveillance, physical violence against people, and destruction of Palestinian homes, schools, and properties. Israel’s use of excessive force has been repeatedly condemned by the United Nations, and has been deemed unlawful by human rights experts. This violence and destruction is made possible by Israel’s trade in arms with dozens of countries, including the UK. Since 2014, the UK Government has approved over £500m worth of military technology and arms exports to Israel, including for weapons of the type used in clear violation of international law. Evil is being done here: systemised, institutionalised and unrelenting. Its manifestations are threefold: physical; bureaucratic; and psychological. The three distinct but interconnected aspects coil, python-like, round the Palestinians, asphyxiating their capacity for agency, all aimed at extinguishing the possibility of hope. The extinguishment of hope is part of the point: it is an Israeli tactic to embed the idea that it will always be dominant. To achieve this requires a refinement in the modes of cruelty that can be visited upon people. This surely is part of the motivation in requiring a person to demolish their own house, a standard practice. 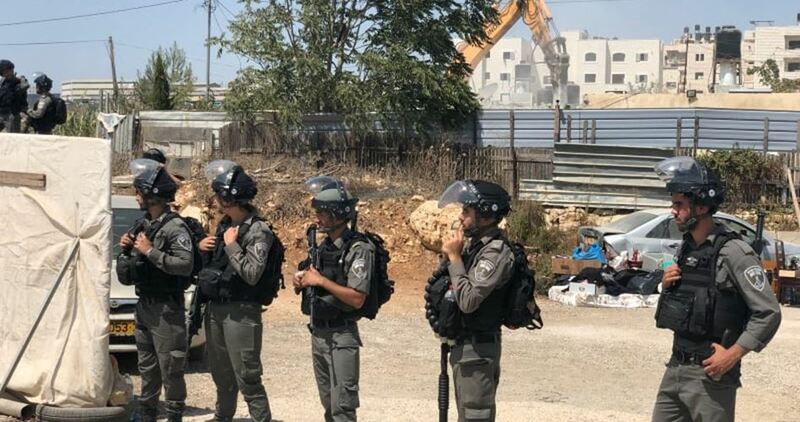 The Israeli authorities have ordered the Palestinian citizen Murad Hsheima, 38, to demolish his own house in Ras al-Amud in Occupied Jerusalem. Otherwise, the municipality would carry out the demolition and force him to pay 60,000 NIS and serve two months in jail. The overarching aim of the current Israeli regime is the Judaisation of Palestine/Israel – ugly word, ugly concept. To achieve that purpose a key condition must be met: That the number of Jews in the area controlled by Israel must be greater than the number of Palestinians. That is the rationale and driving motivation of establishing Jewish only settlements on Palestinian land. I have just returned from a trip to Palestine/Israel. My purpose: to understand more; to interview/have conversations with people; to report back to those who might already be interested and, fond hope, to encourage more widespread interest – and action. The bulk of my time was spent in the Occupied Palestinian Territory (OPT), taking the opportunity to have conversations in Bethlehem, Nablus, Ramallah, East Jerusalem and Hebron. The Palestine/Israel conflict receives relatively sparse coverage in the mainstream media and where it does, coverage seems to me and many others to lean heavily towards an Israeli state narrative that seeks to frame the conflict in terms of Israel’s security concerns, terrorist threat and the absence of a Palestinian ‘partner for peace’. One aim of this and the next post(s) is to attempt, in however minor a way, to offer a counter narrative that helps illuminate the institutionalised viscousness of Israel’s occupation of the West Bank, East Jerusalem and Gaza. Having said that, most of the examples I offer in these posts cover the West bank and illegally annexed East Jerusalem. Israel society is, for the present, ensnared in the current regime. This has got to change. The one thing the current Israeli regime fears is loss of international support, in particular of the USA, UK, and EU. Israel’s occupation, and it’s colonising programme are utterly dependent on the willingness of the USA, UK, EU to actively support it (see Trump’s USA, but in fact practically every administration), turn a blind eye, or to offer ritualised statements of regret at this or that incident or policy, with no further consequence. Yet all these countries have to hand the levers that can help contrain, and turn round the worsening situation. This post offers a little backround to the conflict, and a few examples of what Israeli policy means in practice. It’s not pretty. Subsequent post(s) will offer a commentry on the situation and try to expose some of its essential, underlying features. 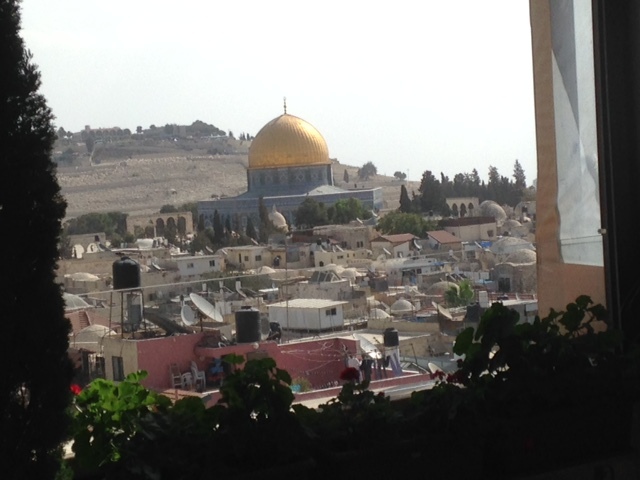 I’m writing this from the rooftop terrace – by no means a ‘luxury’ terrace, but fine – of the hotel with a view of the Al Aqsa mosque, the third holiest site for Islam after Mecca and Medina. The hotel has quite a number of Muslim pilgrims based here. Jerusalem is awash with a variety of pilgrimage groups from virtually everywhere in the world. You can’t walk in the Old City without encountering a snake of seemingly welded-together pilgrims on their way to Al Aqsa or, this for Christians, walking the Via Dolarosa (the Way of Tears) and pausing at each of the Stations of the Cross. There is also the Church of the Holy Sepulchre, built over what is believed to be the site both of Jesus’s crucifixion and his burial tomb, a site for often emotional veneration. Jews (my lot, in general terms) are at it too, for they head towards the Wailing Wall which is ‘a relatively small segment of a far longer ancient retaining wall, known also in its entirety as the “Western Wall’. Together, the entire area incorporating the Western Wall and the Al Aqsa Mosque is known as Temple Mount, or Haram al-Sharif by Muslims. 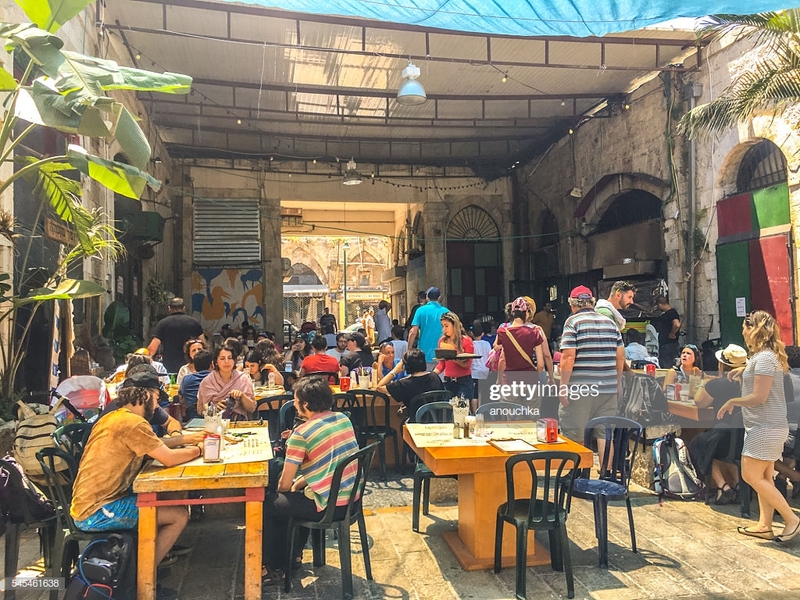 This is an area of sharp contention, religious passion and naked political power games, further destabilised by virtue of Israel’s annexation of the city and its own less than commendable agenda. Which I shall no doubt come to. Not infrequently, one can get a sense of a place, a sense of ‘what’s going on’ by way of a series of vignettes, actual incidents that illustrate, in shorthand form, essential features of a wider canvass. I was at the threshold of the country, queuing at passport control to enter Israel. The manner of greeting can say a lot about the nature of a home. My queue contained a group – a family group: mum, daughter, three lads, probably in their twenties – all obviously Muslim. The lads had what I suppose we think of as typical beards, one or two wore skull caps, and one had that long garment, the name of which escapes me. I was next to them and so heard them talking – talking in northern British accents and clutching their British Passports ready for examination. We started chatting. This article has just been published on the ICAHD UK (Israel Committee Against House Demolition, UK) web site. I would urge you to take a look at the web site as a whole. The website also announces an Edinburgh Festival ICAHD UK benefit gig – Laughing for Palestine – Monday 13 August. The curernt line-up includes Danny Boyle and Comedian Daphna Baram (ICAHD’s Director) in her own show Sugarcoating. Other comedians for the fundraising gig will be announced shortly. On 24 May the Israeli High Court confirmed that the mass demolition and transfer of the Palestinian Bedouin community of Khan Al Ahmar can proceed. This Bedouin village is located on the outskirts of East Jerusalem in the occupied West Bank. From Israel’s perspective, it represents an impediment to the state’s intention to link and expand the exclusively Jewish settlement of Maale Adumin into the area known as E1. In human terms, the judgment means the demolition of dozens of Bedouin family homes along with a school in which 165 children study; that, and also the destruction of pens that shelter 850 sheep. The proposed transfer will move a rural livestock-dependent community to an urban site and life style unsuitable for Bedouin livelihood, culture and traditions. It is an attempt at the vanquishment of a community, body and soul. Eight homes were already demolished by Israel in 2016. Many in the international community are familiar with the story of the now doomed school, built in 2009 by members of the community out of 2,200 recycled car tires, mud and falafel oil – an outstanding example of eco-building and community initiative. Israel, unsurprisingly, refused to provide the children of the village with a modern standard school. Khan Al Ahmar is one of 18 communities located in or next to the E1 area. This area is critical to Israel’s intention, which it pursues with relentless brutality, to create a continuous built-up area between the Maale Adumin Jewish settlement and East Jerusalem and expanding east to Jericho. Therefore this is part of the wider strategic goal to cut the Occupied West Bank in two thereby ending any possibility of a contiguous Palestinian state. In a further twist of the screw, Israeli authorities have approved a scheme for the construction of 92 new housing units and an educational institution in the Kfar Adummim Jewish colonial settlement. This settlement, which is immediately adjacent to Khan Al Ahmar, represents yet another move to create a ‘fact on the ground’ notwithstanding their illegality in international law. And in a display of toxic neighbourliness that no longer surprises, the Kfar Adummim Jewish settlement petitioned the High Court to hurry along the outstanding demolition orders of these rooted, long-established Bedouin communities. ICAHD and ICAHD UK have many times over the years raised awareness about the threat to Khan Al-Amar, but the Israel bulldozer state is immune to entreaties to act reasonably, still less ethically. However, in this context, it appears to be increasingly the case that Israel’s actions are yielding, for it, unintended consequences. The state’s intention is clear: its goal is to create a majority Jewish state with no possibility of a vibrant, equal, and certainly not equal in numbers, Palestinian presence. Hence population displacements, dispossessions, apartheid laws, racist practices and institutionalised brutality, of which Israel’s killings and wounding of Palestinians Gazans is but one sickening example. And through these policies and practices Israel is close to achieving its tutelage over the area bounded by the Mediterranean Sea and the Jordan River – Greater Israel. The current Israel regime believes it is creating for itself one state, a Jewish state, moulded to its current shape and image – the culmination of a settler colonial enterprise whose inception dates back to the 19th century. If there ever was a chance of a two state solution, it is dead now, whether one wishes it or not. It is therefore almost beyond argument that the reality we confront revolves around questions about the nature of the future one state, the state that will lie between the Mediterranean Sea and the Jordan River. This, then, is now the urgent task: to flesh out, argue for and demonstrate what an ethical, pacific, one-state of equal citizens – Palestinians and Jews – would look like. This task is central to the purpose of the One Democratic State Campaign (ODSC), a campaign that emerges – breaks forth into the day light – from the thinking and activism of Palestinians and Israeli Jews, in a mutual, rights-based, endeavour. This campaign will launch formally in the autumn. As important, perhaps, as ODSC is and will be in terms of addressing in practical terms knotty issues of constitutional structure and statecraft, there is at the core of the campaign a metaphorical and psychological dimension. Hitherto the orthodox discourse – a notionally pragmatic one – was rooted in a belief in the necessity and inevitability of division – of people, of religions, of individuals, one from another: the two state dispensation: a Palestinian state and a Jewish one. It was always a false prospective, if only because an entity structured to be a specifically Jewish State must be, as is the current Israel state, a racist state. This must in principle be morally iniquitous and ultimately unsustainable – unsustainable, at least, according to common ethical precepts. The ODSC offers a glimpse of a better future – a break in the clouds. As the song says: ‘There is a crack in everything, that’s how the light gets in.’ A fine sentiment, but one that should not obscure that there is work to be done in support of Palestinians- here, now and with vigour. Edinburgh Festival ICAHD UK benefit gig – Laughing for Palestine – Monday 13 August. The curernt line-up includes Danny Boyle and Comedian Daphna Baram (ICAHD’s Director) in her own show Sugarcoating. Other comedians for the fundraising gig will be announced shortly. With thanks to Leonard Cohen’s song Anthem. I commend it to you as a good and worthwhile read. Stephen Sedley is a former appeal court judge. A collection of his articles and lectures, Law and the Whirligig of Time, will be published by Hart in May.